With 248hp and seating for 7, the Q7 is the practical SUV you’ve been looking for, powered by the thrilling legendary Audi performance. Inside, the 2019 Q7 offers every luxury you’d expect, plus the latest Audi technology for you and your family’s safety & enjoyment. Until April 30th, Spring Into an Audi Q7 with lease payments from $443 bi-weekly including a $2,500 Spring Into Audi Sales Event credit. Test drive the 2019 Q7 today and join the big league. 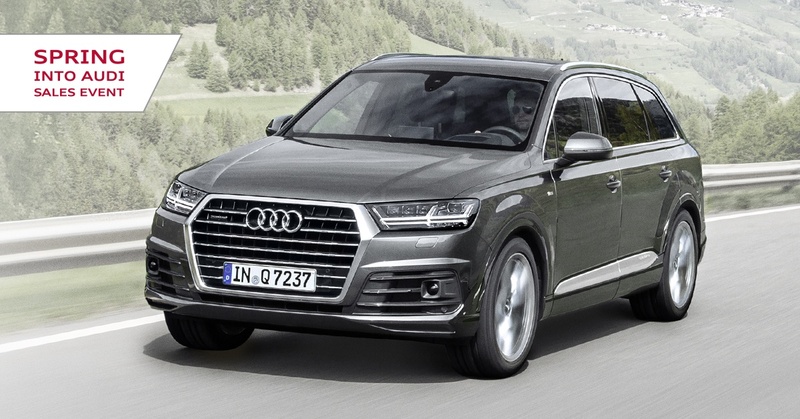 *Limited time lease and finance offer available through Audi Finance on approved credit, on new, unregistered, untitled, and previously un-reported in-stock 2019 Audi Q7 models. Offer ends April 30th 2019 and is subject to change or cancellation without notice. Dealer order/trade may be necessary. Lease example: 2019 Audi Q7 2.0T Komfort quattro (stock #91748) with base MSRP of $63,395 (including $980 freight and $1,115 PDI), at 3.98 % APR for 48-month term with $398 tax-in bi-weekly payment. Lease example based on vehicle price of $66,612 after $2,500 Spring Into Audi Sales Event credit applied (including $500 dealer participation). $4,424 down payment or equivalent trade-in, a security deposit of $800 and first payment of $398 are due at lease inception. PPSA, license, insurance, registration, options, duties, any dealer or other charges and other applicable taxes are extra. See dealer for details. Total lease obligation: $46,477 (excluding applicable taxes). Kilometer allowance of 20,000/year; charge of $0.30/km for excess kilometers.